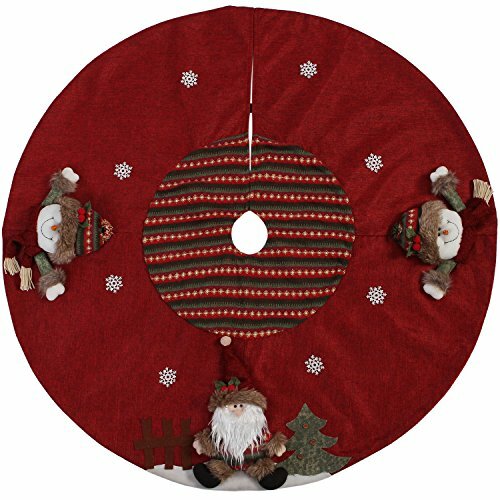 This tree skirt measures 47"/120cm in diameter. It is perfect for decorating your tree's surrounding area and its vivid stuffed Xmas characters with other pop festive elements will certainly create a jubilant atmosphere. (Recommended Tree's Height: 2 - 7 ft). EASY-TO-USE: The tree skirt equipped with hook & loop fastener for you to install and remove it conveniently while compared with the traditional lace-up closure. STEREOSCOPIC POP CHRISTMAS ELEMENTS: Vivid stuffed Xmas characters with other pop festive elements create a jubilant atmosphere. If you have any questions about this product by Sea Team, contact us by completing and submitting the form below. If you are looking for a specif part number, please include it with your message.